Our most popular 1.75"x5.5" ticket printing for sports event is what you need for hosting school championships. We use high quality 12pt paper stock material for tickets. 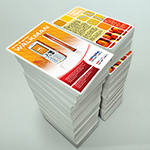 The event tickets can be printed with perforations and sequential numbering. Our 4x5.5" perforated tickets printing for music concert, for example, will be a great thing to have to keep check on your sales forecast. We include perforations to allow easy separation of two sections of the material, so it allows paper to tear easily along the line. With all the different size tickets we offer, you will be sure to have just the right type of tickets for your event. The different sizes we offer for the tickets include sizes 1.75"x5.5" and 2"x5.5". 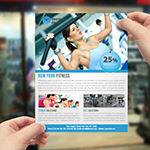 Our ticket printing services are being offered at a great value out of the Long Island, New York area. 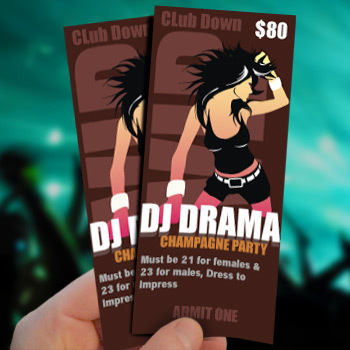 If you want to make your Sweet 16 or school production exclusive, our printing company will help you pull it off with our 2x5.5" birthday bash ticket printing and have a grand celebration. A perforation is a small hole on event tickets. Perforations are usually used to allow easy separation of more than 2 sections of the material, such as allowing paper to be torn easily along the line. 4 digit numbering on the right side of the event ticket is the best way to keep records. 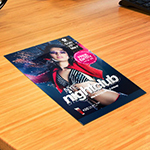 Event tickets are used for events such as concerts, sports, fundraising, music, theatre etc. If you want your event ticket design or quality to look as excellent on paper as they look on the screen, always print them on 12pt paper stock. The event tickets can also be used as contact cards with your details printed on the back because of their sturdy material. When you give your event tickets the right amount of attention, it shows, and it helps you communicate that these tickets are for an event that is very special. Clubs that use tickets that are custom designed get to advertise their club and have a functional way of keeping track of who gets entry. School dances are nights that will live in the memories of students for the rest of their lives. Theatrical productions is a type of event the often employs the ticket format. Sports games is an appropriate event for employing tickets that are beyond ordinary. Banquets, Bars, Nightclubs, Dances, Proms, Hotels, Resorts, Convention Centers, Fairs, Festivals, Churches, Social Groups, Charity Fundraising. Thank you for your best price and quality tickets. Reliable Printing company with best customer service of any online printer I've ever used! You are the best Printer. Thanks!! Can the ticket printing have perforation? Yes, your ticket can have perforation. When you place your order you have to let us know where on the ticket you want it to be perforated. Select size Event Ticket Printing 5" x 2"Event Ticket Printing 1.75" x 5.5"
The client must specify the location of the perforation and the size of the stub. Add numbering to your Event Tickets. Numbering placement determined by crop marks (Top Right edge). Event Tickets will be mechanically numbered after they are printed. Please note that ink is translucent, not opaque and that the background color will affect appearance of the numbering. For white ink, the numbering will be lighter than the background color but the results will not be a solid white. For Red and Blue inks, the background color in the numbered area should be lighter than the numbering. The client must specify what numbers should be used, from 0001 to ending number. 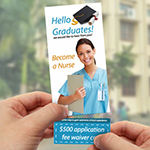 Product: Event Ticket, 5" X 2", 1.75 X 5.5"